Compare all undergraduate economics programs at universities in the Netherlands. 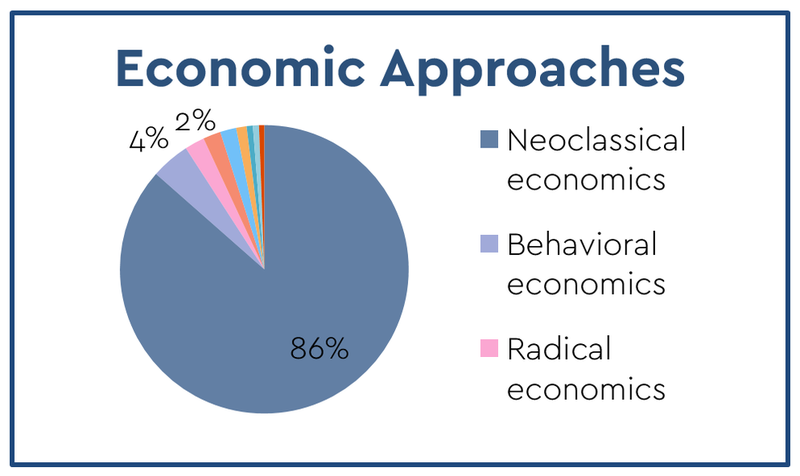 Economics education is dominated by abstract neoclassical theory, statistics and mathematics. Critical thinking, pluralism and real world economics are lacking. How are future economists educated? Today, the curriculum is generally dominated by neoclassical theory, quantitative methods, contains relatively little knowledge of the real economy, and has limited space for critical thinking. See below for details per university program - they do differ quite a lot! Also check the methodology, data background and FAQ of this study, or the summary of the report. If you prefer: go straight to the fundamental discussion: what is economics? Or download the full report. For inspiration on how to set up study programs differently, go here. The data of this report consists of all course descriptions of all Dutch bachelor programs in general economics. Based on these online course descriptions different elements are evaluated and weighted based on the number of ECTS (credits based on workload, full BSc = 180 ECTS). Find more about the methodology regarding the subquestions and the data. "This study shows how the existing economics education programmes in the Netherlands, like in most other countries, are theoretically and methodologically narrow, detached from the real world, and negligent of the broader social, political, and ethical issues. In criticising the status quo, however, the report is not denouncing it but proposing a pluralistic and realistic path towards reforming it." "Rethinking Economics concludes for The Netherlands what we see around the (Western) world: Economics is based on a one-dimensional methodology of making ludicrous unworldly assumptions, apply math to that and think the resulting model, full of hilariously failing predictions, can be used to control the economic world. The consequence is that students are ill-prepared for their important tasks in society and often their fairy tale worldview causes more harm than good when used as basis for policy making or risk management." See here what other people said about the report. We split the findings of this research into four parts: Research methods, Theoretical approaches, Real world economics, and Critical thinking. See the results for each of the universities by clicking on their logos!